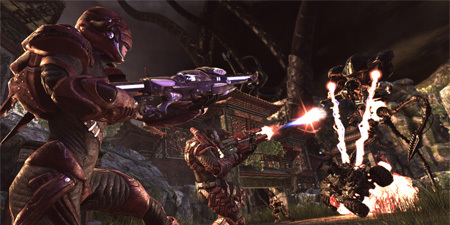 Epic Games, has provided an update on the status of the Xbox 360 version of Unreal Tournament 3. In an interview with the Guardian Unlimited, Rein said that "the game is up and running on Xbox 360, it has been for a long time, and its running wonderfully, it just doesn't have any Xbox Live written into it yet so that's the work that remains." Epic Games revealed a few months ago that the Xbox 360 version will arrive later than the PC and PS3 version because of Microsoft's strict rules for Xbox Live, which in its current form won't accept user generated content for the game. "Microsoft hasn't said "no" yet, but then they haven't said "yes" either." Rein explained. "We need them to say "yes," and we need them to do it soon." Rein explained that it is technically possible to have user generated content on the Xbox 360, since "you can go onto the console and copy your songs onto it and play movies off a memory card - the machine's capable of allowing you to transfer your content around, and even letting you play your music while playing many games." Unreal Tournament 3 mods are already being played by PS3 owners and that's why Rein believes that Sony deserves some credit for letting their users do something Xbox 360 owners are not able to do yet. "I think Sony is a real pioneers in this - I think they deserve a lot of credit for letting us do this. They're really doing something different, and it hints at what they want to do with the PlayStation Network in the future. They're definitely on the right track!" So my question now is, would the ability for the user to generate their own content for the 360 open a window for the modders to get in and start some real homebrew?